Get a small plastic shed, to sit nearby ,to put your mostly run stock in .. Finances permitting I will definitely look into that. Will you be at the show this year, Sean? I hope .. I was in my friends car and on the way last year when my medicine told me it didn't like to travel... ( Rotator cuff repair ..I'm @ 100% now ) Hint Bring "CASH"
I'll definitely be there. That's where I bought my Forney last year! Also, the USAT GP 38-2 locomotives is the biggest I'm planning to get. Does that loco have a min radius? I was under the impression it fits around LGB's R2s. 8' curves with body mounts.. Here's design #15 of my new railroad... I think I'll keep the name the same for this RR, unless I come up with a better one... There are a few R2's, as required by the spaces allowed, but the inner loop is all R3 or larger. The yard does use R1s, but that will be fine for what I'm running. Here's the full layout. There's a station at the bottom right and the larger multi-track station at the top. 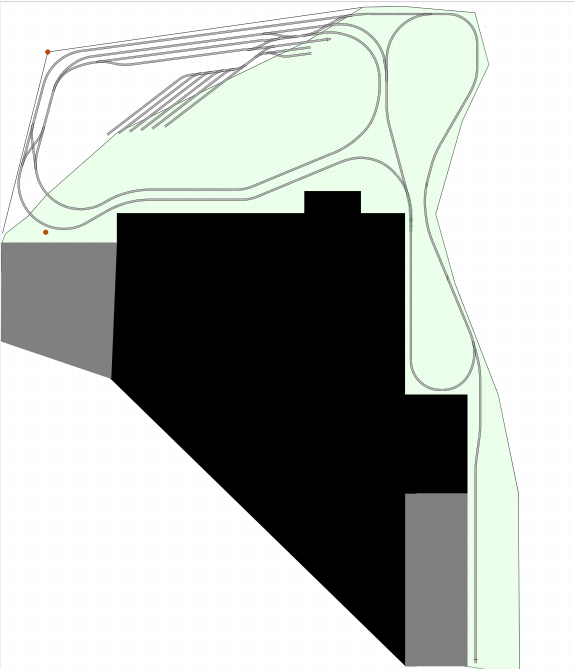 There is a grade from one side of the house (black box) to the other, but I believe it will be manageable with the track as I have designed it. Also, I know that having the yard in the center of the layout seems a bit odd. Yeah, it's not my favorite thing about the design, but there's enough space to incorporate large plants so that the yard will not be visible from the right of the railroad. It's not the most ideal, but I think that if I do the gardening right the layout will feel a lot larger than it actually is since you'll never see the whole thing at once. Also, if anyone knows of a US supplier of 45-degree crossings, that'd be great! Otherwise I'll have to build one out of two straight pieces. 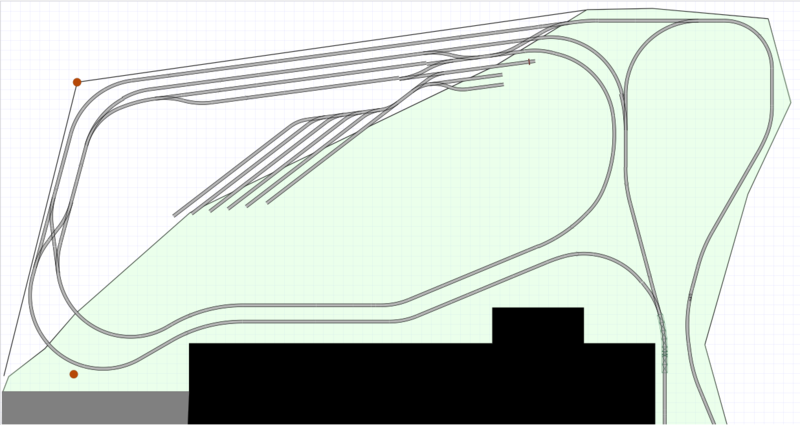 I'd eliminate the straight on the right side of the upper right loop, and enlarge that curve to R3... the more R2's you can eliminate the better running your layout is... making that change also makes a nicer looking curve, rather than a curve interrupted with a straight and then more curve. Many plants have tried to encroach on my right of way, but I introduce them to Mr. Hedge Trimmer... Recalcitrant ones get to mee Mr. Chainsaw.... problem solved. Well, since it's my dad's land - and he likes the bush - I can't do anything to it. As for the crossing, that doesn't seem mathematically right to me... Using a 1320 with the R3 points would yield a parallel track, not connecting to the other switch. Bill, Im referring to the crossing on the left of the diagram, the large double slip just above the bottom curve.